WEMU radio reports that the Ann Arbor city council has approved by a vote of 7-2 the first reading on changing the ordinances to allow residents to raise chickens in their backyards! Council will hold a public hearing on the issue next month before taking a final vote. Council member Marcia Higgins voted for the ordinance changes, but says she still has questions regarding inspection and run-off issues. The public hearing will be held during council's first meeting in June. Those of you who've been following along, know this is great news, indeed. 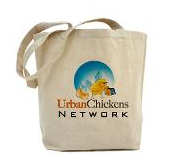 I hope to be able to find (and publish here) a transcript of the public hearing during the June council meeting, it's sure to be enlightening as to where folks line up on the issue of urban chickens. Here's the urban chickens commentary from Arbor Update, which you should find useful for ongoing coverage. I suppose that something is better than nothing. But as the ordinance is currently formulated, owners of adjoining property could veto keeping of chickens for any reason, and the 4 hens allowed by the ordinance would need to be kept 40 feet from any dwelling. There's a small chance the neighbor veto and 40-foot setback could be amended at the 2nd reading, when the ordinance will be formally enacted (or not, depending on how the immediately preceding Public Hearing goes). Thanks Edward for the link and Dave for providing the on-the-ground update.